Las Vegas, NV (11-22-17) — An unprecedented reply to the Criminal Division of the Justice Department featuring music by The Eagles and the U.S. Air Force Band has been filed by award-winning filmmaker, Dr. Leonard G. Horowitz, titled “The Godfathers of Dope Paradise.” The video supplements a detailed history of drug trafficking and money laundering among Hawaii’s wealthiest families, companies, and banks, with a petition calling for a Special Prosecutor to investigate the State’s concealed conflicting interests in opposing President Trump’s border security law affecting Hawaii’s airports, seaports, and “Opioid Emergency” killing millions of people internationally. To read more, CLICK HERE. . . . This correspondence replies to your U.S. Department of Justice, Criminal Division, mail of October 30, 2017 (Reference Number DA300631151) prompted by my colleague and business partner’s appeal to the President through the White House. Sherri Kane, whose appeal for help (WH 20170311-11466986) was denied, as one of many fellow victims of organized crime in Hawaii. Attached is a copy of the Criminal Division’s correspondence denying relief for two stated reasons: (1) “[in]sufficient details or evidence to warrant action;” and (2) “concerns have already been submitted to proper authorities,” including the FBI. Unfortunately, the Criminal Division’s response on behalf of the President neglects two sets of facts established by FBI agents who conducted related investigations. Both FBI investigators independently filed reports indicting organized criminals in Hawaii aided-and-abetted by the willfully blind courts; only to have their recommendations for further actions quashed by superiors working under Robert Mueller, giving an “impression of impropriety” in the bureau. My name is Dr. Leonard G. Horowitz, and I am writing to you as an expert in several fields of science and medicine as detailed in Appendix A (hereto attached). Petitioner’s Personal Knowledge and Experience of the Banking Industry Detailing Organized Crime and Violations of Anti-trust Laws Precluding Alternatives to Opioids. The media has heralded several multi-billion dollar settlements by leading banks between 2010 and 2014 for drug money laundering. Banks capitalizing on illegal drug trades included the Hong Kong Shanghai Banking Corporation (HSBC), Wachova, Wells Fargo, Citigroup, JP Morgan Chase, Bank of America, Western Union, and Goldman Sachs. Despite the Bank of Hawaii and First Hawaiian Bank being founded by merchants heavily prospered by illegal opium trafficking, curiously these banks have disproportionately escaped scrutiny, justifying this open reply and petition. Appendix B attached hereto discloses a little-known problem confronting law enforcers and natural medicine makers today nationwide—a dilemma defying President Trump’s “opiate emergency” policy favoring alternatives to addicting drugs. I learned about this widespread Sherman Anti-Trust Act violation from damage being done to my company in our efforts to advertise a safe and effective alternative to opiates. In fact, as you can read and confirm by further investigation, these illegal proceedings are being falsely attributed to the Trump administration. The ploy restricts competition in healthcare and drug-free commerce, and favors Big Pharma and the illegal drug trade. The example documented also engineers society by fraud to accept opioids and reject many safer and effective natural alternatives to narcotics. Quoting the National Drug Intelligence Center (“NDIC”), “Hawaii’s unique geography, isolated location, heavy reliance on importation of commodities, high volume of tourists and commercial traffic, and diverse demographics provide excellent opportunities for illicit drug trafficking and pose considerable challenges to law enforcement. . . . Honolulu is the primary transshipment point for drugs and drug proceeds to, through, and from the state.” As mentioned, the main banks historically implicated in laundering money derived from illegal opiates is the Bank of Hawaii and First Hawaiian Bank.1, 2 The NDIC’s 2009 “Drug Market Analysis” especially identifies the Big Island of Hawaii as a “High Intensity Drug Trafficking Area” (“HIDTA”). This location is recognized for sourcing large quantities of marijuana and methamphetamine today. Subsequent to that NDIC publication a growing national threat has emerged from this same area of the Big Island with the manufacture of the Class 1 narcotic hallucinogen dimethytryptamine (“DMT”), as further detailed below. Hawaii’s historic role in the exploding illegal drug trade, especially the opioid crisis, is summarized in a new video I produced for your perusal accompanying this open reply titled, The Godfathers of Dope Paradise. This 15-minute production helps explain why President Trump, Ms. Kane and I, and many other victims of Hawaii’s judicial corruption, have been deprived of due process and justice, and why these rights have been denied by Mr. Chin and Judge Watson—a subordinate of Chief Justice J. Michael Seabright. (My cases include CV NO. 16-00549 DKW-KSC, and also CV NO. 15-00186 JMS-BMK). DMT is clearly and convincingly growing rapidly in popularity and risking Americans’ health and safety. Attorney General Chin’s administration has aided-and-abetted this tragedy by willful-blindness to Sulla’s illegal enterprise repeatedly made known to Chin and his subordinates in Honolulu and on the Big Island too. This negligence and obstruction of justice violates the restrictions on domestic manufacturing of DMT established by the U.S. Supreme Court in Gonzales v. O Centro Espirita Beneficente Uniao do Vegetal, 546 U.S. 418 (2006).4 Permitting Sulla’s dangerous and sometimes deadly drug enterprise to expand rapidly as it has done by trafficking “hoasca” to colleges and communities across America must be addressed by your Administration, tandem to the emergency declaration and remedial policies. Please recognize that this deadly DMT enterprise competes directly against traditional religions at a time when all religions are growing in disfavor. The ayahuasca movement featuring the “god molecule” solicits mainly mentally and emotionally troubled youth seeking greater purpose and meaning in life. This racket compromises our “One Nation Under God.” Hawaii is the main source of illegal ayahuasca sold in the United States by virtue of its required tropical rain forest culture. Sulla’s Big Island operations have largely monopolized this enterprise, aided-and-abetted by willfully-blind and/or bribed law enforcers. Widely advertised “hoasca rituals” now pepper the Internet. 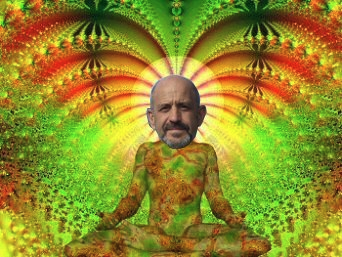 Even “ayahuasca tourism” to Hawaii promotes hallucinogenic “journeys” into “self-awareness”. These solicitations defy public health, risk public safety, embarrass law enforcement, and undermine citizens’ faith in the Department of Justice and state and federal protections. Mr. Sulla’s nuisance, and allied “hoasca tea” traffickers, promise users “divine experiences” for the cost of as much as $700 per dose. Under abused religious exemptions, this tax free illegal gain generates a massive amount of profit and power to influence law enforcers and other officials. This hypocrisy also permits vast sums of money to be laundered through banks and sham real estate deals as we have documented in our cases. The amount of money being laundered by DMT manufacturing on the Big Island alone is staggering. In the State of Oregon, for example, throughout that High Intensity Drug Trafficking Area (HIDTA), law enforcers seized between 2010 and 2013 more than 50,000 dosage units of DMT. At $700/dose maximum, the street value of this contraband was nearly $35,000,000.00. Multiply this by the twenty-eight (28) total HIDTA sites reported in 2017 across America by the U.S. Drug Enforcement Agency (“DEA”). That total yields $980 million estimated annual trade sourced mainly from Hawaii by Mr. Sulla’s enterprise—THE ECLECTIC CENTER OF UNIVERSAL FLOWING LIGHT-PAULO ROBERTO SILVA E SOUZA. This racket operates with several real estate money-laundering tax-evading partners, public records and online searches reveal. Sulla’s racketeers also advertise DMT as “community medicine.” Thusly, they practice medicine without a license under “religious protections” defying Gonzales. “Journeying” is reported by Sulla’s son, Paul J. Sulla, III, to be “natural medicine” for depression, drug additions, and “purging” neuroses. And the lack of regulations and law enforcement has now permitted this “medical practice” to be abused by criminals nationwide. 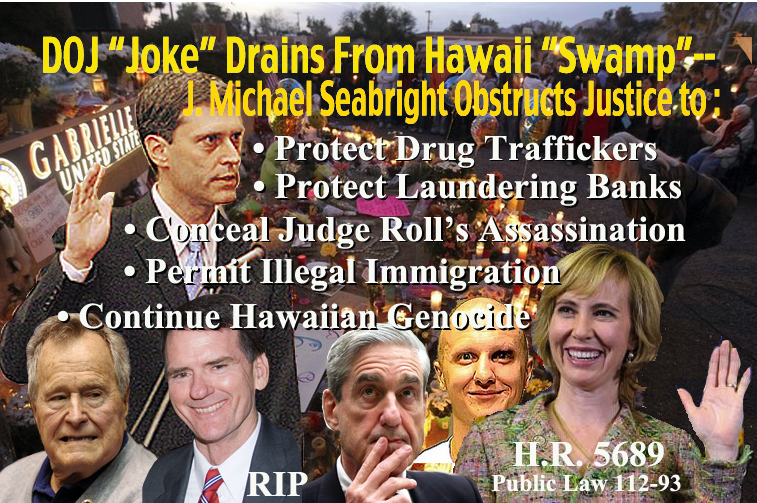 Sulla, as a licensed lawyer, has repeatedly demonstrated uncanny “immunity” in multiple cases before Hawaii judges and the Office of Disciplinary Council after he was Publicly Censured, recording a pattern of tax evasion, defrauding the Treasury Department, money laundering, and thievery. .
Judge Seabright had no reasonable justification for witness tampering, evidence tampering, and harboring a most heinous crime gang and drug cartel profiting from Judge Roll’s assassination. All of this was tied to the legislation opposing money laundering filed by Rep. Giffords in H.R. 5689 (along with Public Law 112-93). Judge Roll and Rep. Giffords worked together. Their heroic actions intended to stop the drug cartel’s illegal immigration and cyber-money-laundering schemes. Given these facts, and under these circumstances, Judge Seabright’s actions are arguably treasonous, especially since they permitted billions of dollars of drug cartel profits to be subsequently laundered through banks. the FBI’s Honolulu Division whose agents and resources were seriously constrained under Robert Mueller’s administration, permitting publicly known injustices, including those aforementioned, to go unattended and unpunished. The case of the “Arizona Massacre” be re-opened, assigning a Special Prosecutor to independently investigate the records compiled by the FBI under Robert Mueller’s administration, for evidence of involvements by organized crime opposing border security and money laundering legislation advanced by officials, Judge John Roll and/or Rep. Gabrielle Giffords; including the court filings and video evidence struck by Hawaii Judge Seabright bearing on these crimes. As trusted leaders dedicated to “draining the swamp” that undermines America’s greatness, burdens the economy, and damages public health and safety, your anticipated remedies are greatly appreciated. Thank you, in advance, for issuing a more in-depth reply to this correspondence than the one mailed by Justice Department officials to Ms. Kane on October 30, 2017. Given the aforementioned facts, the evidence cited, available court records, previously filed FBI reports recommending agency actions, it cannot be reasonably argued that “insufficiency of evidence” or “sufficiency of process” precludes further action at this time. Finally, to assure transparency in these urgent matters of social concern, I pledge to openly publish this correspondence and your responsive mailings online. We are encouraging members of the press to do likewise; and we have established multiple online resources to do this, including revealing articles published by fellow activists, petitions for encouraging citizens to support your responsive leadership, and educational videos, including The Godfathers of Dope Paradise, helpful in addressing these matters. President, Medical Veritas International, Inc. The author/petitioner, Dr. Leonard G. Horowitz (hereafter, “I” or “my”) is an expert in the field of HIV/AIDS, having personally trained more than 30,000 healthcare professionals during the early 1990s, encouraging high quality confident care. I am also an award-winning film producer, successful author of three American bestsellers, and a Harvard-trained expert in media intelligence impacting the human behavior and he opioid problem in America. 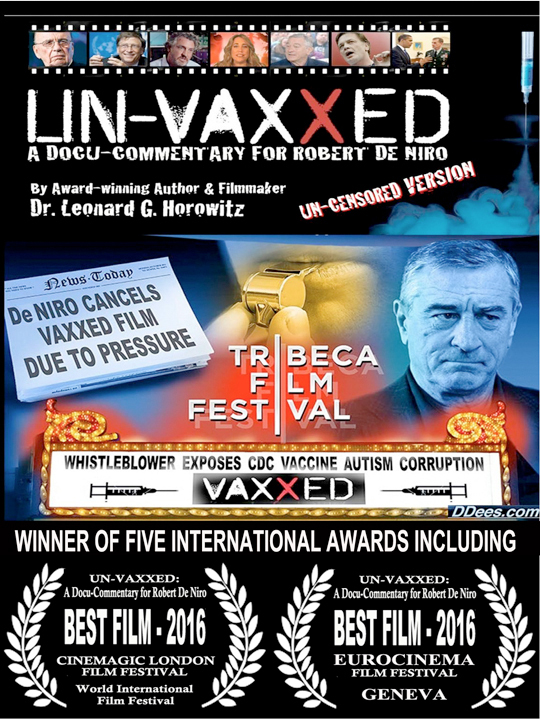 I am by far America’s best credentialed, most prolific, most controversial, and most censored pharmaceutical industry whistleblower. (A summary of my credentials is attached here along with my apostille of domestic and foreign service. Click: Ambassador Credentials WONM Apostille.) Beyond my personal distress and financial victimization by the partires named above, and my support for many fellow victims, I write compelled by my public duty (i.e., “public duty doctrine”). 42 U.S.C. § 1986 compels every citizen’s responsibility to prevent damage from racketeering enterprises involved in drug trafficking. Accordingly, I am similarly compelled to circulate this open letter as widely as possible, to alert others to the dangers and challenges We The People face while depending on officials such as yourselves for relief. Thus far, however, legislators, law enforcers, health professionals, consumer protectors, and political activists, have been impotent in tackling these complex urgent criminal matters intertwined with media intelligence and psychosocial impacts. I understand from President Trump’s emergency declaration that your administration urgently seeks safe and effective natural alternatives to addicting drugs, so I may be helpful in this regard. I am well-aware of, and have honorably recommended, such alternatives for nearly forty years. Openly disclosing my commercial interests that critics might find conflicting, I am the co-founder of HealthyWorldStore.com—among the earliest online natural health products providers sustained by millions of people globally during the past two decades. My publications and commercial operations are respected and sustained by thousands of professionals working in every field of science and medicine. My supporters respect my many novel inventions, new healing technologies, and consumer friendly online services advancing innovations in medicine, including recent discoveries in “therapeutic frequencies.” My works blend recording artistry with “energy medicine.” Millions of people worldwide have viewed my videos addressing safe and effective alternatives to risky and costly vaccines and drugs. My advances in musical mathematics and water science have literally caused the music and natural healing industries to evolve. You can listen to our “therapeutic music” broadcasting over the 528Radio.com network. We support nearly a dozen different genres of 528Hz-transposed music at the present time, and provide artists and other users with free remastering services through 528Records.com. APPENDIX B. Example of Misrepresentation and Sherman Anti-Trust Act Violation Restricting a Promising Homeopathic Alternative to Deadly Opioids: CBD528. Intelligent people have knowledge of homeopathic medicines, and their preferred use over chemo-pharmaceuticals by European doctors and government leaders for centuries. By integrating 528-frequency resonance technologies to homeopathic developments, I have helped address the opioid crisis by providing a low-cost natural pain and depression remedy branded CBD528. But sadly, this product was precluded from commerce by e-Merchant, a leading e-banking gateway. Referencing Aaron Easton, e-Merchant officials threatened to terminate our commercial account if we did not stop advertising CBD528. Mr. Easton falsely inferred that the enforcement branches of the federal government and the banking industry have allied to preclude sales of any product labeled “CBD.” In effect, I witnessed e-Merchant administer a Sherman Anti-Trust Act violation damaging my company and society based on the false allegation and false presumption that CBD528 contained a restricted hemp extract considered a pharmaceutical, CBD. E-Merchant officials thus forced my compliance under false pretenses, virtual extortion, with illegal restrictions; and not only aided-and-abetted the opioid industry by fraud, but deprived my company as a natural healthcare provider from engaging competitively in e-commerce. To my knowledge, the U.S. Congress never authorized banking officials to act as deputy Food and Drug Administration regulators. Summarily, CBD528 homeopathic that contains no trace of chemical CBD whatsoever (whereas legitimate homeopathics never contain any of the original source substance) is being denied its potential to help relieve the opioid emergency. These illegal and unethical e-commerce policies and propaganda defy the President’s stated objectives, and should be addressed most timely by officials in support of the President and declared emergency. The President’s declared opioid emergency signifies America’s damaging addictive “chickens” hatched in China have come home to roost. “On a macroeconomic level, the sea barbarians had turned the tables, as Chinese silver now flowed to Europe. But to the Chinese, the opium trade was an unmixed evil, corrupting its officials, demoralizing its people (including, most vexingly, its soldiery), draining its wealth, raising the cost of living, and undermining the Son of Heaven’s authority. . . .
P.S. We annex an abstract of the new law, now about to be put in force. “Any foreigner or foreigners bringing opium to the Central Land, with design to sell the same, the principals shall most assuredly be decapitated, and the accessories strangled; and all property (found on board the same ship) shall be confiscated. The space of a year and a half is granted, within the which, if anyone bringing opium by mistake, shall voluntarily step forward and deliver it up, he shall be absolved from all consequences of his crime. Data cited by CNN, and the U.S. Centers for Disease Control & Prevention (“CDC”). The Bank of Hawaii was established in 1893 by Charles Montague Cooke (1849–1909) with his brother-in-law Joseph Ballard Atherton and business partner Peter Cushman Jones. Samuel Northrup Castle and Amos Starr Cooke co-founded Castle & Cooke (C&C) as merchants financed by opium and sugar trades, and as “lay missionaries” in the Seventh Reinforcement of the American Board of Commissioners for Foreign Missions” This group was later named the United Church of Christ (UCC). C&C became one of the “Big Five” corporations that dominated the economy of the Territory of Hawaii largely by trafficking opium through China, and selling the stimulant ginseng to China, aboard commissioned ships. Atherton managed the “Old Dispensary” in Honolulu where the “medicine” was kept and sold. Castle & Cook exclusively agented Dr. Jayne’s Family medicines in Hawaii, including opium (branded “laudanum”), manufactured in Philadelphia. Illegal shipping was provided by either Russell & Co, or J.D. Spreckels & Bros beginning in 1879 (incorporated as the Oceanic Steamship Company in 1881, the first line to offer regular service between Honolulu and San Francisco). Russell & Co. opium trafficking notables included Warren Delano, Jr., the grandfather of Franklin Roosevelt (32nd President of the United States) who served as the Chief of Operations of Russell and Company in Canton; Robert Bennet Forbes (1804–1889) the head of Russell and Company; and John Murray Forbes (1813-1898), brother of Robert Bennet Forbes and the great-granduncle of 2004 presidential candidate John Forbes Kerry. Following King David Kalakaua’s death in 1891 from “medicinal” opium, chloroform, cocaine, and alcohol that caused the last Hawaiian Monarch’s kidney and liver failure, Castle & Cook merged with Matson shipping, dominant on the Honolulu harbor front today. Alexander & Baldwin acquired Castle & Cook (and Matson) in 1969. The First Hawaiian Bank (previously “Bishop Bank” or “Bishop & Co.”) was founded in 1858 by Freemasons Charles R. Bishop and William A. Aldrich. Bernice Pauahi Bishop appointed Charles Montague Cooke as one of the first trustees of the Kamehameha Schools, known then as the “Bishop Estate.” This is the largest private landownership in the Hawaiian Islands, comprising approximately 9% of Hawaii’s total area. Freemason Archibald S. Cleghorn (husband of Hawaii Princess Likelike) was the Collector General of Customs, collecting taxes on opium from May 1, 1887 to April 15, 1893. In an effort to gain control over opium importation in competition with fellow Freemason “missionary” merchants importing opium through China, in 1886 King Kalakaua approved legislation to license and tax the importers. This secured his downfall. A breach of contract, and strong opposition by the New England opium dealers, led to a bribery case against the King. At the same time, a secret takeover plot was orchestrated by Skull and Bones Society freemason Alfred Wellington Carter—a lawyer, manager of the Parkers’ Ranch, and later judge in the Republic of Hawaii and Territory of Hawaii following the secret society/U.S. Govt. aided coup for annexation. Alfred Welling Carter was the son of wealthy merchant shipping parents, and was interested in securing the Kingdom, its land, and the Parkers’ Ranch property for himself and his “missionary” cohorts in opium trafficking, sugar commerce, and beef sales. Carter leveraged the King’s bribery scandal and opioid-related dementia as reasons to establish the “Missionary Party” and “Hawaiian League,” that along with armed resistance posed by the all white “Honolulu Rifles,” imposed upon the King the Bayonet Constitution that usurped power over Hawaii. In the aftermath, a new “reform” legislature was elected and the King’s Opium Act of 1886 that granted the Monarchy the power to license and tax opium was scrapped, restoring free trade in opium by Hawaii’s sugar/opium cartel. These predecessors-in-interest to the “Big Five” bankers and money launderers control the lion’s share of commerce in the “aloha state.” They succeeded in converting the Royal Crown Lands, the Bishop Estate, and Parker Ranch, all in favor of the secret cartel that continues to launder billions of dollars through “front” companies, trusts, and foundations, including the Hawaii Community Foundation (“HCF”). The HCF is named as a money laundering entity in the grand jury Affidavit of James Benish, currently obstructed by U.S. District Court Judge J. Michael Seabright. More information on the complicity of “Deep State” agents, including Barack Obama and his family involvements in the Bank of Hawaii and related “microfinancing” and consumer fraud schemes is published on: http://judicialcorruptionnews.com/obamas-grandmother/, linked here. The U.S. government’s National Survey on Drug Use and Health sampling found that the number of people in the U.S. who have used DMT in some form has been up almost every year since 2006 — from an estimated 688,000 in 2006 to 1,475,000 in 2012. According to the U.S. Supreme Court in Gonzales (2006), “huasca” churches act illegally when they fail “to import the tea pursuant to federal permits, to restrict control over the tea to persons of church authority, and to warn particularly susceptible members of the dangers of hoasca.” Sulla’s Big Island enterprise does none of the above. The 10th Circuit maintained a “heightened standard” following a divided decision. The Court split after discovering the church’s concealments, and a different majority’s vote to block even the importation of the hallucinogen by purported “religious” organizations was noted. Oregon HIDTA Performance Management Process database, April 2014. Mr. Sulla’s Big Island, Hamakua Coast, supply of the controlled substance to the mainland is facilitated by real estate agents: W. Augustuz Elliott, Gregg Gadd, and Kelly Moran. Media reports indicate suppliers are expanding now to South Florida. See, for example, CR. NO. 09-00398 LEK; and CR. NO. 07-00354 HG. Seabright’s sriking of the filing, and “delusional” ruling, demonstrated his willful blindness to the evidence that I filed as an expert in public health, behavioral science, and motivational psychology, having published science applying the FBI’s most advanced methods of analyzing psychopathology of serial killers. Rep. Giffords’s anti-money laundering (loophole) legislation, H.R. 5689, never proceeded to a vote in the House following her shooting, and the media simply and exclusively exploited the Arizona Massacre in favor of gun control proponents. This request is additionally required in lieu of public knowledge of the ongoing beleaguered FBI investigation into Honolulu’s indicted police chief, Louis Kealoha. This case further evidences, yet diverts from, more severe statewide corruption in law enforcement. The troubled investigation of Kealoha has been delayed and excused for “lacking resources” according to press reports, and statements by federal officials based in San Diego.